Great card! And thank you for a look into your 1969 life. Joan--Your blog post brought back memories! I don't remember hearing about the room makeover, but it's such a wonderful story. Charl, it was a special trip!! I'm so glad we did it together! oh my goodness you have made me cry today. I was only 4 in 1969, but my mom used to tell me that she made us watch the moon landing -- and Archie Bunker, and Sesame Street. How wonderful that your mom gave you the gift of travel, and of a new groovy bedroom! thanks Merry! it was an amazing time. I'm glad your mom exposed you to some of it! Thank you, Joan, thank you. You give me hope. I actually have tears in my eyes as I write this. I guess that is a good indication of how stressful I am finding the day to day news cycle and the divisions I see in society. It is especially distressing when the divisions involve family and friends. I feel like I spend my days just holding my breath. Your card is lovely, by the way. So bright and cheery. Yes it is stressful. I worry but I keep hope alive!! Thanks so much for your kind words. The first thing that came to mind when I saw this card was that I remembered that those were the colors that your mother decorated your room in...in fact every time I see this color combination I think of your bedroom! I was always so impressed with any project your mother took on...I still have the Raggedy Ann type doll that she made for me...it has my name sewn on the smock/apron...I don't let anybody touch it, I cherish it way too much! I cannot believe you remember that room!! My mom made me a doll too and I still have it. It's so funny that you still have yours. Mine doesn't have my name on it though!! And thanks for the ear worm. 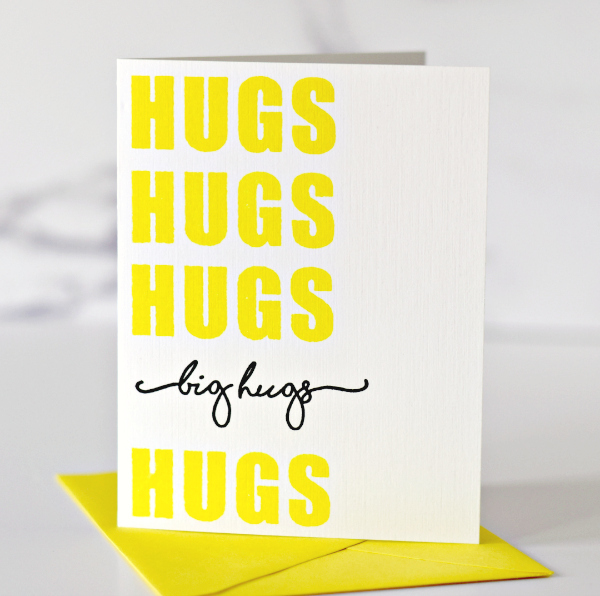 Thank you for the lovely "HUGS" card and the encouragement for these stressful times! Every post you write I feel we must have known each other, we've had so many similar experiences and (I'm guessing) we are close to the same age. However, you were on the east coast, I was on the west. I'm so glad to get to know you, a little bit at a time, now. Loved your post. Love your card. Perhaps we can come through this current situation after all. Love the card. Love that Lemonade Distress Oxide. Love the memories it evoked. Sigh. Every part of your post was perfection. The card says it all. Like JanetB, I feel so fortunate to have come upon your blog & receive your reflections that mirror some of my lifetime also. It sounds like you were "cut from a different cloth" than your mom and dad. And yes, our country has gone through some extremely tough times & we will get through these current rough waters. I especially loved the postscript about your mom's voting evolution! My 98 year-old very Catholic dad voted for Obama and welcomes my gay brother and his partner (who is African-American) into his home. People can change! thanks for those very kind words. I've watched my own opinions change over the decades so it is possible! I get it at Ellen Hutson. Love it. Joan, I could listen to your stories for days. Your trip sounds dreamy. Your mom sounds amazing - I love that she decorated your room while you were away. Thank you so much for sharing. Wow. This 1969 story took me back, too. It was a coming of age time for me, hyper-aware of the changes taking place and how painfully they were coming about. Vietnam, Woodstock, the moon landing, Chappaquiddick, civil rights, Charles Manson. It was hugely crazy changing times and it sure made an impact on me. Now... your mom was a complex woman, full of surprises. It moves me that she funded your trip and redecorated your room while you were gone. She was coming to grips with the young woman you were growing into and trying to accept those changes. Funny, I had grown up with a pink room, but when I got to junior high age my room changed to yellow. I still love yellow and I adore your card with all those big yellow hugs. What a way to send some happiness! Yes, it needs to go in the mail. I bought three sheets of stamps today, not realizing postage went up in January. $10 for a sheet of stamps now, but it won't stop me mailing my cards. thank you for this wonderful card and post.